Currently works as an Associate Professor at the Faculty of Music, at Ss. Cyril and Methodius University (Skopje, Macedonia). Courses taught: “Character Dances”, “History and Analysis of Modern and Contemporary Dance” and “Performance theory”. Her fields of interest include the theatrical and performing arts, dance theory and anthropology. She obtained her Bachelor’s and Master’s degrees in Ballet Pedagogy and Choreography at Academy of Theatre Arts (GITIS), in Moscow, Russia (1992). She then went on to complete her Master’s and Doctoral studies in Theater Theory at the Faculty of Dramatic Arts in Skopje (2003 and 2010, respectively). Is the author of the following books: Character Dances (Magnat, 1998), Discourses of Dance Art (Jugoreklam, 2001), Ballet Dramaturgy (FDA, 2003), History and Theory of the Art of Dance (MI-AN, 2006), and Aspects of the Performative Kinesthetic (Jugoreklam, 2011). Took part in the preparation of Mian’s General and Macedonian Encyclopedia (MI-AN, 2006) and the encyclopedia Music, Opera, Ballet (MI-AN, 2009); the projects “Macedonian Theater in the Context of the Balkan Theater Sphere,” (Theater Institute FDU, 2003-2006), “Extracurricular Activities in Schools with a Mixed Ethnic Composition” (European Agency for Reconstruction and Development, 2004-2006), the Nomad Academy (a network of Balkan institutions, the Macedonian counterpart – Locomotive, 2008-2010), “Macedonian-Croatian Relations” (FDA, Skopje, and the Faculty of Philosophy, Zagreb, Croatia, 2010-2012). Member of the National Committee for International Council for Traditional Music since 2012. As a contributor of the project CD-ROM “Theatre in Macedonia” (FDA, 2003) was made the recipient of the collective award “Goce Delchev”. 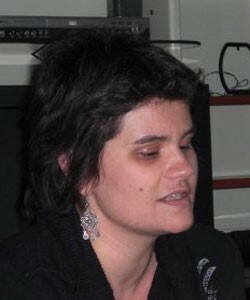 PhD (1978) is a teacher and translator, residing in two cities, Belgrade and Skopje. After graduating from Ss. Cyril and Methodius University-Skopje, Faculty of Philology in October 2000, with a BA in English and American Studies (with German), she was made the recipient of two awards: the 26th of July Medal, awarded to the six highest ranking students, in their final year, for the fields of architecture, social sciences and the arts (Frank Manning Award), and the 24th of May Medal, awarded to the ten most accomplished graduates in the given academic year (Ss. Cyril and Methodius University, R. Macedonia). In 2002, while on a Fulbright Scholarship Grant, she began her graduate studies, at the University of Kansas, in the US (American Studies Graduate Program, The College of Liberal Arts and Sciences). Her focus, then, and later on at the University of Leeds’s School of English and Workshop Theatre post-graduate program (as a Tetley Lupton Scholar), has been fueled by two key questions plaguing the fields of performance theory and American Studies, respectively: the workings of memory in layered textuality and the incorporation of auto/ethno/biographical elements in critical pedagogy. A sample of this enquiry was published, in 2009, as part of the Life Writing: the Spirit of the Age and the State of Art, eds. Meg Jensen and June Jordan (Cambridge Scholars Publishing): Chapter V, ‘Baiting History, Baiting Memory: The ‘contact worlds’ of David Albahari’s Bo(a)rder Narratives’. Other publications include: Re-Thinking Local Cultural Policy: new identity and new paradigm (Ed. By Violeta Simjanovska: “Pedagogies of the Home and International Schools: New Models for (De)Localized Cultural Policies?”, PAC Multimedia, 2011); INTERPRETATIONS, European Research Project for Poetics and Hermeneutics (ERPH), Volumes 5 and 6 (Eds. Kata Kulavkova and Natasha Avramovska, ‘‘Murder is our Business’: Fragmented Picture-Telling in Weegee’s Violent Naked City Docudramas’, 2011); Srgjan Kerim’s bi-lingual (Macedonian/English) collection of poems, An Undiscovered World (‘Neotkrien svet’) (English translation, Matica, 2011); Katica Kulavkova’s bi-lingual (Macedonian/English) collection of poems, Erased Spaces (‘Brishan prostor’) (English translation, Blesok Publishing, 2011). Research areas include: auto/biographical and bo(a)rer narratives of bilingual Eastern-European exile/exiled writers; Post-World War II American Dramatic texts/Theatre Collectives (particularly focusing on August Wilson, Tony Kushner, Craig Lucas, Spalding Gray, Paula Vogel, Ken Urban); Post-Yugoslav Theatre (Biljana Srbljanović, Uglješa Šajtinac).Currently, she works as a Reader for ETS (Education Testing Services) and the International Baccalaureate Organization (Theory of Knowledge). Also, co-edited the essay/literary criticism section of the international online bi-lingual literary magazine, BLESOK (2012-2013). MA diploma in Cultural Studies and Literature at the Institute for Macedonian Literature in Skopje in 2013. Currently, she is president at SFERA – civil organization that pretends to acts in several social spheres (art, culture, socal issues, media, marketing, publishing, education, ecology, sustainability…) in order to achieve personal and social development from different perspectives. Her specific areas of interest are media and public relations. At the moment, she is engaged as a PR person for CCCS. 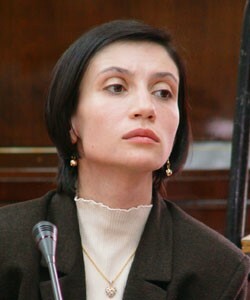 A Macedonian writer. Graduated from the Department of General and Comparative Literature, at Ss. Cyril and Methodius University in Skopje (Macedonia). Had published her first story “Streets” in a collaborative student publication called Calculation at WCL. 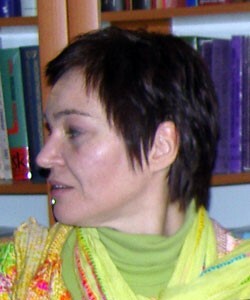 Her first novel, In-Between, was published in 2008, and this novel was a finalist for the prestigious national ‘Novel of the Year Award’ given annually by the daily newspaper “Utrinski vesnik”. With her creative prose, she has participated in numerous events, readings, conferences, such as the International Biennial of Young Artists from Europe (The International Association of the Biennial of Young Artists from Europe) in 2009. In 2010, she published her second novel, The Catalyst 33. Critics call her writing style ‘a fiction with a bold sense of self-irony’; it is a fiction that shows, at the same time, a broad literary sensibility and a vast range of storytelling techniques. Published work: In-Between (2008, Skopje: Ili-ili Publishing); The Catalyst 33 (2010, Skopje: Ili-ili Publishing). Curator at the National Conservation Centre (Institute for the Protection of Cultural Monuments), in the Department of Easel Painting. Has made over 200 conservations of paintings, religious paintings on canvases and paper. Has participated in the team conservations of the site Stobi (2010) and the Colored or Painted Mosque in Tetovo (2012). 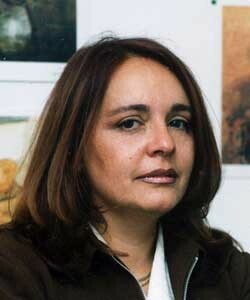 Her areas of interest include: the protection of cultural heritage, the protection of old crafts, painting. Is the author of the scientific paper “Restoration of the Traditional Crafts for the Purpose of Protecting the Intangible Cultural Heritage” (Master’s thesis). Has worked as a stage and costume designer, a make-up artist for the Macedonian National TV and Theatre, and for the film “Voice of Light“. Is the author of illustrations for The Environmental Dictionary and six ecological picture storybooks. Has worked as a coach in the NGO “Eco-Art”, as part of the project “A Children’s Workshop for Paper Recycling and Other Raw Materials for Items with Value in Use” (2000-2002). Has completed training in felting, and from 2002 to 2012, successfully makes art objects, paintings and jewelry from wool. Has participated in group exhibitions, and in 2008 had a solo exhibition of paintings in the pastel technique. A Senior Conservator -Restorer of icon paintings at The National Center for Conservation, in Skopje (Macedonia). Specialized areas include: conservation and restoration of icon collections (the Ohrid Icon Collection (11th -17th cent. ), Prilep Icon Collection (17th -19th cent. ), icons from the Lesnovo Monastery (19th cent. ), the Struga Icon Collection (16th -19th cent. ), the collection of the Museum of Macedonia, icons from the treasury of St. John at the Bigor Monastery (17th -19th cent. ), icons from the monastery Virgin Mary Immaculata (17th -19th cent. ), collection of icons from the Slepche Monastery (18th -19th cent. ), icons from the Leshok Monastery (17th -19th cent. ), icons from the collection of the Museum of Veles (19th – 20th cent. ), conservation and restoration of the iconostasis crosses (the Great Iconostasis Cross from the Zrze Monastery (17th cent. ), the Great Iconostasis Cross from the Toplicki Monastery (16th cent. ), the Great Iconostasis Cross from the Slepche Monastery (16th cent. ), the iconostasis from the Leshok Monastery (17th -19th cent. ), the imperial doors from church St. Nicolas, Chelopek), conservation and restoration of wall paintings (the wall paintings from the Karpino Monastery, the wall paintings from St. John at the Bigor Monastery). Publications include: “Conservation of the Great Iconostasis Cross from the Toplicki Monastery”, Kopanichar, God. VII, No. 8, 2003; “The Contemporary Context of the Protection of the Tangible Heritage”, Patrimonium (7-8, 2010); “The Education of the Professional Management Staff for the Protection of Cultural Heritage: the conditions in Macedonia”, Kulturno nasledstvo, 35-37 (2009-2011); “Financing Culture in the Republic of Macedonia: The Protection of Cultural Heritage”, Socioloshka revija, 1/2011. Individual exhibitions (paintings): KIC-Skopje (1991); Cultural Centres in Kumanovo, Prilep and Bitola (1992); Art Galleries in Shtip and Kumanovo (2007). Awards: Valedictorian (Graduating Class of 1987), Ss. Cyril and Methodius. International Cooperation and Studies: Specialization in Arabic calligraphy at the University Mimar Sinan in Istanbul (Turkey), 1991; Study residency at Restoration Center “Grabar” in Moscow, 1996; Study Residency at the Conservation and Restoration Laboratories, at the Byzantine Museum in Athens (Greece), 2001; International Course for Restoration of Fresco and Wall Paintings at the Instituto per l’arte e il Restauro in Florence (Italy), 2012. 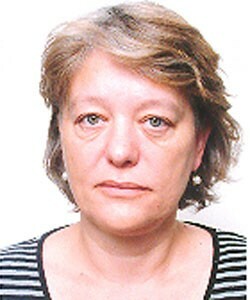 Member of The International Council of Museums. Graduated from the Department of Macedonian Language and South Slavic Languages at the Faculty of Philology “Blazhe Koneski”, Ss. Cyril and Methodius University-Skopje (graduation thesis: A View on the Pronouns It, This and That from a Referential Point). 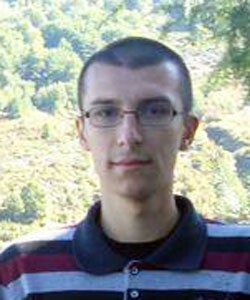 Completed his Master thesis in the field of Macedonian language and linguistics at the same Faculty (title: The Distribution of the Pronominal Clitics in the Macedonian Language). Awarded the 26th of July award (bestowed on the best of the graduating classes in the arts and humanities), established by the Frank Manning Foundation (London, United Kingdom) and Ss. Cyril and Methodius University. Has participated in a number of national and international linguistic conferences. A selection includes: Young Slavists Conference 2010, Faculty of Arts, Charles University Prague, Czech Republic; Students’ Linguistic Conference STULIKON, Faculty of Philology, University of Belgrade; XV Scientific Conference Days of Blagoja Korubin, Institute of Macedonian Language “Krste Misirkov”, Skopje; International Scientific Symposium “Blazhe Koneski and the Macedonian Language, Literature and Culture”, Skopje, 2011; Symposium: POETIK, STILISTIK UND LINGUISTIK DER TEXTE VON BLAŽE KONESKI IM “GRALIS-KORPUS”, Institut für Slawistik der Karl-Franzens-Universität Graz (Austria, 2012); XXXIX Scientific Conference of the International Seminar for Macedonian Language, Literature and Culture, Ohrid; Fourth International Scientific Conference – Applied Linguistics Today – Challenges of the Modern Time, Applied Linguistics Association of Serbia (ALAS), Faculty of Philology, University of Belgrade, Faculty of Philosophy, University of Novi Sad (2012). His written work has been published in domestic and international magazines and conference proceedings, both in the fields of linguistics and literature. A selected overview includes: “The Grammatical Category of Person and Its Reference to Notions in Reality”, in: Sixth International Scientific Conference of Young Researchers of the Macedonian Language , Faculty of Philology “Blazhe Koneski”, Ss. Cyril and Methodius University-Skopje (2008); “Agreement in Relative Clauses” (with Aneta Duchevska and Bojan Petrevski), Annals of the Faculty of Philology “Blazhe Koneski” (2011); “On Some Aspects of Globalization and Their Influence on the Macedonian Language System”, Philological Studies (2012); “On the Problem of Pronouns in the Balkan Context”, Slavistic studies (2012). Member of the organisation board of the VIII International Scientific Conference of Young Researchers of the Macedonian Language (2013), wherein a participant in 2008 and 2010. An active participant in the civil sector, as a member of the Board of Directors of the Association “Community Development Institute” (Tetovo) and as a representative of “APTES – People’s Technique” (Tetovo). Independent researcher. Graduated from the Department for Macedonian Literature and South Slavic Literatures, at the Faculty of Philology “Blazhe Koneski” (Ss. Cyril and Methodius University, in Skopje). Currently, an MA candidate in Cultural Studies and Literature at the Institute for Macedonian Literature (Skopje). 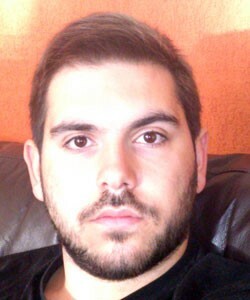 Has worked as a junior researcher in the international project “Literacy Development in the Humanities“. Author of two books of poetry: From Earth to Heaven (2005) and For Kibela Ma, with Love (2010). 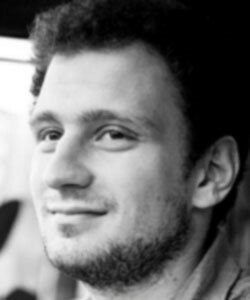 He writes literary reviews and interpretations for several Macedonian literary journals. His interests include: areal literatures, especially the Mediterranean literary and cultural context, imagology, contemporary Macedonian literature, as well as the connection between critical thinking and writing. Lawyer (LLB). His graduate thesis reads “The State Audit Office as a Controller of the Spending budget” (2012). Currently, he is enrolled at the Graduate Studies Programme in Public Administration studies, at the Faculty of Law “Justinian the First”, Ss. Cyril and Methodius University (Skopje, Macedonia). Areas of interest include: Financial Law and Public Administration.